I'm a thief! I "stole" a bunch of stuff from the hospital when Ben was born that I am still using and wish I had more of. Imagine me cat-burglarizing my way out of the hospital, pink panther style. I felt like that episode of Friends where Ross takes a suitcase full of complementary items from the hotel because he was such a cheapo. I thought I would do a post about this so that any soon-to-be moms can know to have sticky fingers at the hospital when it comes to these things. Now, to be fair, our nurse was completely OK with us taking all of these things, but your nurse may not be as cool as ours. She was the shiz. So proceed with caution. 1. Pacifiers - Ben still uses the green soothies that he used in the hospital. We have purchased more, obviously, but he still uses the same kind. I have tried to give him the soothie for older babies, but he looks at me like I hurt his feelings when I give that one to him. And it definitely doesn't "soothe" him. At the hospital, they had a million of these pacifiers, individually wrapped. If the paci fell on the floor, the nurses would just throw it away and grab a new one. Crazy! A pack of two of these things sell for about $6. So, stock up! 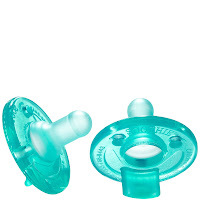 If you have a paci baby like me, you cannot have enough of these things. 2. 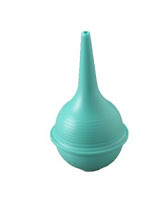 Bulb Syringe - They have these awesome big green bulb syringes for sucking out all of the snot, etc. They work great, and you can't find another one like it to buy. These are also individually wrapped. I took two - the one that they were using on him, and the spare that was in his supply cart. I just had to throw one out last month, because it developed a gross smell that I couldn't get rid of (I swear I wash the thing, but maybe I "let it go" too long one time). So now I just have one of these bad boys. 4. Diapers - Once a pack is opened, they can't use it on another baby (I think). So try to make it so that a new pack just happens to get opened right before you check out. You can obviously never have enough dipes. 5. White Petroleum Jelly - For Boys with Circumsized Wee Wees. This is the stuff that you gob on the little dude for a few days. Take a couple of extra tubs and gauzes. 6. Formula - We took a bunch of formula home with us. We didn't end up using it, and I plan on actually donating it all this weekend. BUT, this can obviously be very useful to those that are using formula. Formula be expensive yo. so I am not using it now, but they may match for you. A complete set of pumping parts costs close to $50, so definitely worth it to have. Also, ask for any freebies you can get from the lactation consultants. They usually can give you about one of anything you need before you have to pay for it. 8. Socks, Pads, Mesh Underwear - These are for you Mama. I don't still have/use these things obvi (gross! ), but I did use/want them very much when I first got home. I recommend squirreling these items away and asking for a complete restock each day you are in the hospital. 9. Food for You - Now, this isn't something that you can really take with you, except for maybe a random muffin or something. But I want to say to eat up Moms! Order anything anytime you want. Order two of it. No one is going to be bringing you cooked food to your bed for a while again (or ever). Am I the only person who really likes hospital food? I sometimes fantasize about being brought my hospital food in bed.....ahh...oh wait? You're still here? Sorry, I was thinking about chicken fingers. Notice that I didn't include receiving blankets on the list. Some people love the hospital receiving blankets. I took a couple, but never used them. I just loved my Aden + Anais too much I guess.